20-Year-Old Masterpiece Revised for the New World – Contemporary Galleries | Full service furniture dealer located in Charleston, West Virginia. In 1994, we were preparing to relocate our business to our current Smith St. location and Herman Miller was shipping out its new Aeron chair. It was a great year, not only for us, but for the rest of the world, because the Aeron chair changed what we knew a chair to be. 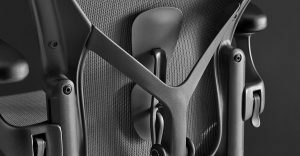 With its ergonomic design, solid construction, and unique design, the Aeron chair redefined what to expect from an office chair. If you became a proud owner of the Aeron chair within the past 20 years, you are most likely still sitting in it today. Even with a 12-year warranty, chances are your chair is still working just like the day you first sat in it. Not many chair companies can say they make a chair to last that long. Computers can now fit in your pocket, offices are leaving the cubicles and laying out open spaces with low-profile desks, and the day to day work life has changed to compliment the technological advances of the past two decades. Not only has technology changed, but health research has led to advancements in ergonomics and anthropometrics over the past few years. 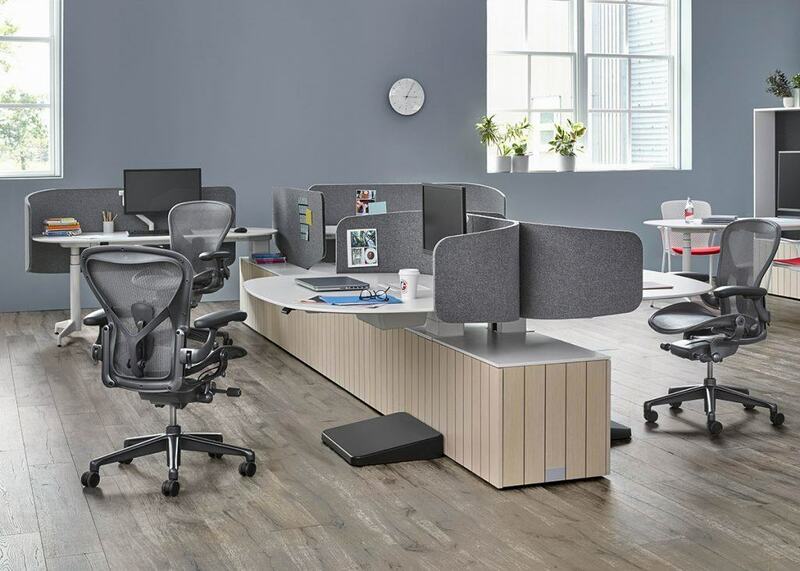 The new Herman Miller Aeron Chair not only utilizes new types of materials and manufacturing, but also takes into consideration the latest health research to maximize the benefits of owning one of the new Aeron chairs for today’s workspace. Though it may look like the same chair, it has been aesthetically updated with a slimmer chassis, making it 4 lbs. 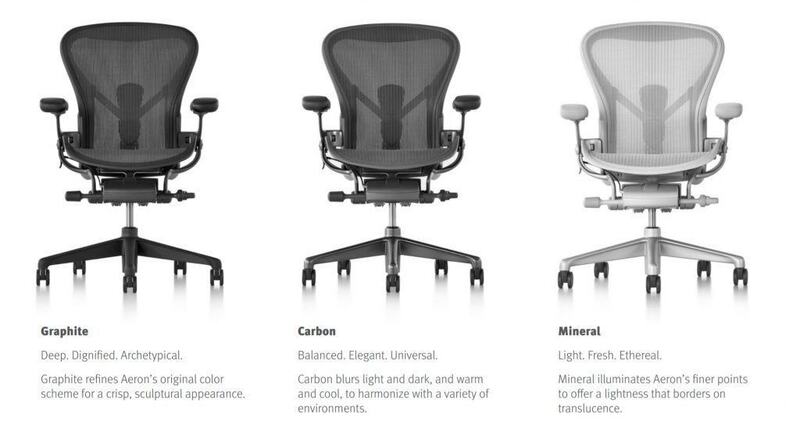 lighter than the classic Aeron. The knobs and adjustments have been redesigned with a few key features added too. No longer will it take hundreds of dial turns to adjust the tension. 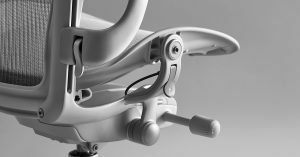 Within a few turns, you can now adjust the new Aeron’s tension and the additional adjustments are more responsive too, making the chair faster to adjust for today’s on-the-go working environment. They modified the arm adjustments. The adjustment mechanism is located in the same place as the classic Aeron but it’s a much smoother transition, accomplished with one hand (vs. two as was needed with the classic chair.) Today, the arms adjust up and down, and pivot in and out. An enhancement in the new chair is that the arms also now slide forward and backward to support more positions, without the arms getting in the way or leaving any surface damage. Moving our way down, a re-engineered, slimmer tilt mechanism provides sitters with a smoother ride and enables seemless posture modifications, from upright to recline and every position in between. 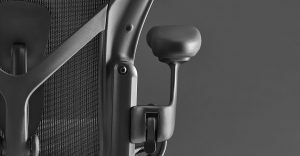 To enable a person to be fully supported in an upright posture and across a wider range of postures, the frame angle of the new Aeron has been adjusted 1.8 degrees forward. Whether a person is positioned forward for typing and intense focus, or fully-reclined for conversation and contemplation, they will find the new Aeron moving with them— seamlessly. The definitive features of the elastomeric suspension have been redesigned with new manufacturing techniques that enable it to have 8 different zones across the seat and back. 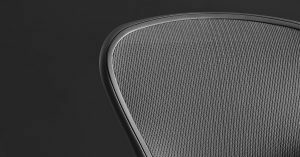 The new 8Z Pellicle® is tighter at the edges and becomes looser in key areas where the body rests against the fabric, providing better comfort and support than the original Aeron chair. Though the original Pellicle® breathed, allowing the body to stay cool while sitting for long periods, the new 8Z Pellicle® has greater breathing capabilities that enable air, body heat, and water vapor to pass through the seat and backrest. 4 SUPPORT zones have the most tension. Located closest to the top and bottom edges of the frame these zones help the sitter to fully engage with the Pellicle and are the first point of contact with the suspension material to reinforce a healthful seated posture. 2 SOFTENING zones have the least amount of tension and cradle the sit bones and scapulars. This helps to reduce pressure in these areas and allow you to move freely in the chair while still engaging with the Pellicle. 2 STABILIZATION zones have mid-level tension. They accommodate the key muscle groups of the sitter at a healthy angle without letting the body sink/ hammock into the chair. Together, the 8 zones deliver the preemptive support your body needs to stay active throughout the day. A new support option, PostureFit SL ™, was designed to support the sacral and lumbar regions of the spine as well as help strengthen the spine. An active body is at its strongest when standing, chest open and pelvis tilted slightly forward, it makes sense that you would be better off sitting like that too. 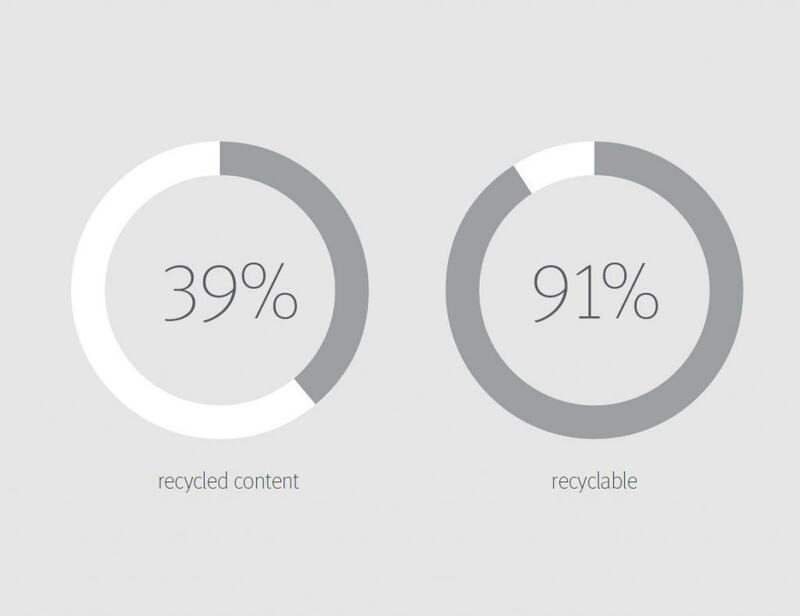 And that’s exactly where PostureFit SL comes in. This improved feature is adjustable and has individual pads, which stabilize the sacrum and support the lumbar region of the spine, in order to mimic a healthful standing position. Because you don’t sit still, the new Aeron’s dynamic support responds to your every move. Even though the pads flex and move separately, to match the movement of the sitter, they are controlled together to ensure proper alignment. To loosen the pressure from the spine, rotate the knob backward. To dial in for more support–fitting the curvature of the spine, rotate the knob forward. In all instances the sacral pad engages first, leading the way for the lumbar pad to follow. 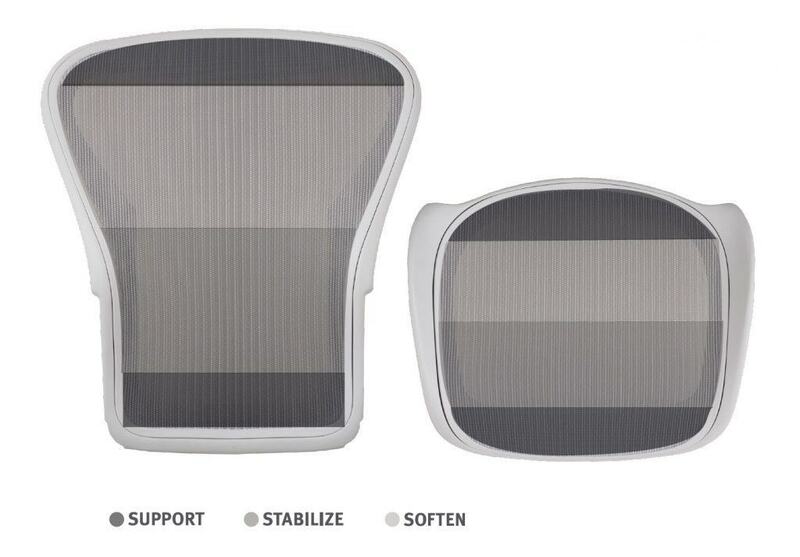 While PostureFit SL is the most advanced option, three additional back support options are available so you can customize the chair based on your work needs. Through hundreds of samples, tests, and iterations, Herman Miller arrived at three tightly curated, holistic material expressions. Graphite is the darkest, a modern take on the original Aeron. Carbon offers a balanced neutral that works equally well in warm and cool environments. Mineral is the lightest, ideal for today’s more open office environments. 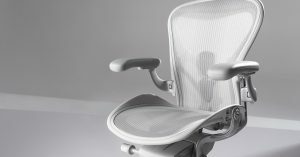 Similar to the classic Aeron, Herman Miller designed and manufactures this chair to be sensitive to the environment and removes unwanted substances, achieving BIFMA level® 3 and Greenguard Gold Certified status. They have also achieved the new Cradle to Cradle Silver standard. C2C is an ecological certification that honors Aeron for being designed using safe materials that can be disassembled and recycled as technical nutrients or composted as biological nutrients after its useful life. We are happy that the Aeron chair is getting an update after 22 years. Herman Miller and Don Chadwick have designed and developed a new masterpiece that is meant for today’s new office environments. 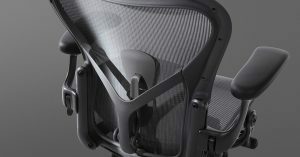 Ultimately, they didn’t recreate or redesign the Aeron Chair— they remastered it, with newer technologies and health research for the purpose of staying on top of the changes that have taken place over the past two decades. It is still the same chair, just better, and that is what we like about this new Aeron – It’s not Aeron 2, it’s Aeron for Today. If you have questions about the updated Aeron chair by Herman Miller our experienced sales staff can help, call 1-(800)-292-6984.